Padmaavat Movie Review: Ranveer, Deepika & Shahid Starrer Is “Much ado about nothing!” Reviewed byTanveer Khan on January 24 . Cast: Deepika Padukone, Shahid Kapoor, Ranveer Singh, Aditi Rao Hydari, Jim Sarbh Director: Sanjay Leela Bhansali Duration: 2 hours 44 minutes Screening Formats: 3D, IMAX 3D, 2D Language: Hindi, Telugu and Tamil. Cast: Deepika Padukone, Shahid Kapoor, Ranveer Singh, Aditi Rao Hydari, Jim Sarbh Director: Sanjay Leela Bhansali Duration: 2 hours 44 minutes Screening Formats: 3D, IMAX 3D, 2D Language: Hindi, Telugu and Tamil. PLOT Set in 1303 AD medieval India, Queen Padmavati is married to a noble king and they live in a prosperous fortress with their subjects until an ambitious Sultan hears of Padmavati's beauty and forms an obsessive love for the Queen of Mewar. Sanjay Leela Bhansali’s magnum opus ran into hot waters since the time it was announced; but many delays and several cuts later, his epic saga ‘Padmaavat’ finally gets to see the light of day. Starring Deepika Padukone, Shahid Kapoor and Ranveer Singh in the lead, the film is a period drama based on the legendary thirteenth century queen Padmavati or Padmini as she is popularly known, and the Sati/Jauhar tradition that she followed to refrain from being captured by another man. The film opens with the King of Mewar, Maharawal Ratan Singh (Shahid Kapoor), who in search of precious motis for his wife in the Singhal kingdom, comes face-to-face with a free-spirited and extraordinarily beautiful Princess Padmavati (Deepika Padukone). As sparks fly, the twosome gets married in an elaborate ceremony and a couple of songs later, Padmavati becomes the new queen of Mewar. 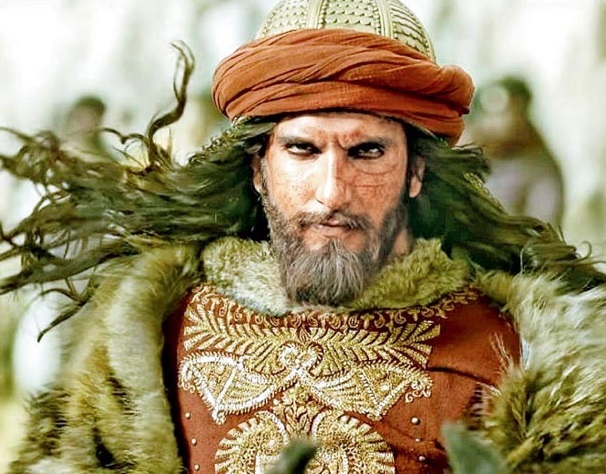 While love slowly blossoms between the new couple, Alauddin Khilji (Ranveer Singh), the callous Turko-Afghan ruler takes over the Delhi Sultanate, just like the way he goes to any lengths to lay his hands on all things nayaab! He hears of the exceptionally gorgeous queen Padmavati and longs to win her love. Khilji subsequently lays siege on the fort of Chittor, hoping to win Rani Padmavati too, but all hell breaks loose as the queen takes charge of situations, once her king goes out to war. Bhansali’s interpretation of Sufi poet Malik Muhammed Jayasi’s single work of fiction “Padmavat” is poetry in motion and it speaks volumes of his earnest efforts in portraying all things grand and opulent. Right from Deepika’s costumes and make-up (which includes her unibrow), to Ranveer’s language and the detailing of the fortress, Bhansali has taken extreme care to make his film believable and even grander. As for the performances, Deepika is brilliant as the legendary queen, who does not flinch at embracing her husband’s funeral pyre, without submitting to the lustful ruler of Delhi, and lets her eyes express most of her emotions. Shahid Kapoor as the unshakably calm Rajput king stands tall in his role, although at some point, his character comes across as caricaturist. Ranveer Singh steals everyone else’s thunder in a role tailor-made for him. Sporting black costumes, frizzy hair, and a guyliner, complete with a scar, he lights up the screen with his menacing presence, although the director went a little too overboard with Khilji’s depiction. Aditi Rao Hydari shines in her quick role. The face-off between the king and his arch nemesis is visually and emotionally striking and well-written. The songs are easy on the ears, especially the Ghoomar and Ek dil ek jaan tracks. Sudeep Chatterjee’s cinematography is breathtakingly beautiful and he captures the essence of Rajasthan in its entire magnificence. Dialogues pack a knockout punch and while there was uproar over the release of the film, ‘Padmaavat’ only glorifies the rich Rajput culture and portrays it in all sincerity. On the contrary, ‘Padmaavat’ is a tediously-long film, which starts to test your patience towards the end. Some scenes could have been done away with as also Ranveer’s Khalibali song. The story of the Rajput king to keep intruders off his kingdom; the tale of Khilji’s unrequited love and lust for the most beautiful queen in the country and the saga of Padmavati submitting herself to fire to protect her honour, are deftly woven together to bring one grand story that had everyone talking. All in all, Padmaavat is a regular love story told on a very grand scale. Next : Karan Johar Lands In Legal Trouble, Can Be Jailed For Five Years!